The separate pool with a large waterslide and kid's area is the reason I bring my family to the beautiful resort. The multi-level lobby showcases an incredible view of Lake Las Vegas and the surrounding mountains. The elegant rooms feature heavenly white bedding with bright reading lights. The rooms also capture incredible lake and mountain views. Smoke free premises. 493 units, some two bedrooms. 9 stories, interior corridors. Accessibility (Call). Waterfront. I-515 exit 61A southbound; exit 61 northbound (Lake Mead Pkwy), 6.3 mi ne, then 4 mi n, follow signs. 101 Montelago Blvd 89011. 2 restaurants, also, Marssa, see separate listing, full bar. hot tub, cabanas, self-propelled boats, regulation golf, recreation programs in summer, bicycles, health club, spa. 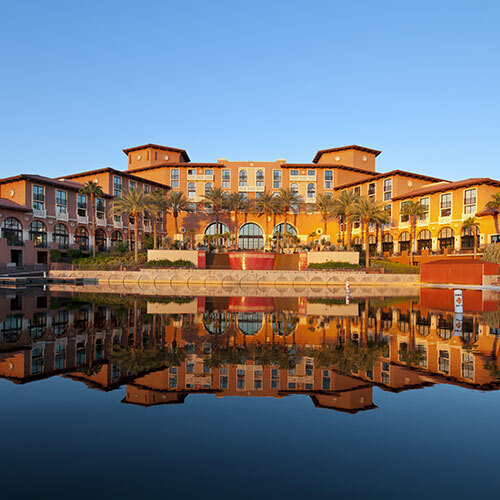 valet and coin laundry, boarding pass kiosk, room service, area transportation-Montelago Village & The Hilton Lake Las Vegas.